With this 1.8" LCD color video monitor, not only are you able to see and hear your baby both day and night, but you can comfort them with vibration and sounds without disturbing them! 2.4 GHz Digital technology eliminates interference and provides a secure and private transmission over a distance up to 350 feet. The crib unit features 3 lullabies, 2 nature sounds, 2-level vibration, a nightlight, an auto-shut off feature that shuts down after 15 minutes, and a 'lock out' button so your child can not access the crib unit's buttons. Crib unit can be mounted to a crib or placed on a night stand. The parent unit controls all the child's crib unit features remotely so you don't have to be in the room to treat your baby to the sounds, music or vibration. Parent unit has a volume control, brightness control and belt clip, and includes rechargeable batteries. 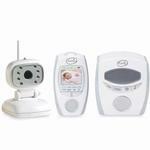 Set includes one parent unit, one mountable camera with night vision, one wireless crib unit, and 2 AC adapters.